The first woman to play football for Cal Lutheran has put 11 points on the board as of this writing, converting on every one of her extra point attempts in two wins and one loss. 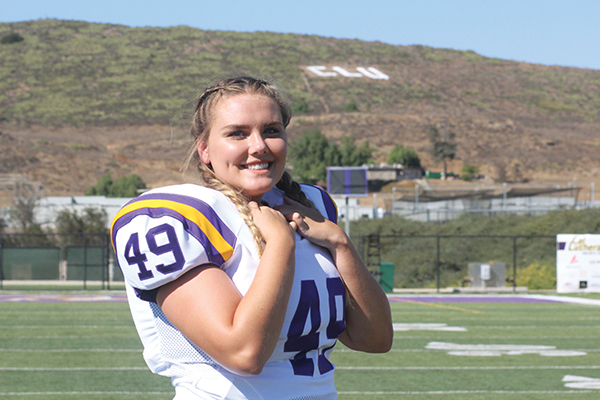 Kicker Morgan Salzwedel’s football career began near the end of her first year in high school when, as a star center-defender on her girls soccer team in Morgan Hill, California, she was approached about using her right leg on the gridiron. She made her first tackle in high school, saving a score when a member of a rival team evaded the other defenders. Salzwedel is the fifth member of her family to play a Division III sport at Cal Lutheran. Her parents, Dave ’90 and Jenifer (Larson ’90), played soccer and volleyball, and her uncle Joel Larson ’92 and aunt Jodi Larson played basketball and soccer. A marketing communication major, she envisions a career connected with sports. “Working in a major sports market … with a successful football, soccer or basketball team or network would be a dream job for me,” she said.